Cannabinoids exert most of their effects through the CB1 receptor. This G-protein-coupled receptor has been shown to be functionally coupled to inhibition of adenylyl cyclase, modulation of ion channels, and activation of extracellular signal-regulated kinase. Using Chinese hamster ovary cells stably transfected with the CB1 receptor cDNA, we show here that Δ9-tetrahydrocannabinol (THC), the major active component of marijuana, induces the activation of c-Jun N-terminal kinase (JNK). 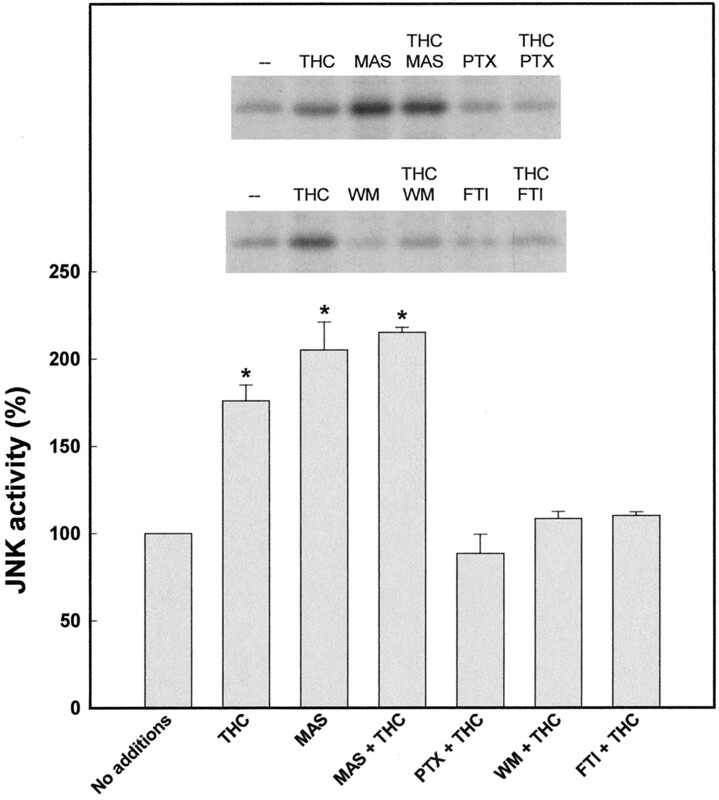 Western blot analysis showed that both JNK-1 and JNK-2 were stimulated by THC. The effect of THC was also exerted by endogenous cannabinoids (anandamide and 2-arachidonoylglycerol) and synthetic cannabinoids (CP-55,940, HU-210, and methanandamide), and was prevented by the selective CB1 antagonist SR141716. Pertussis toxin, wortmannin, and a Ras farnesyltransferase inhibitor peptide blocked, whereas mastoparan mimicked, the CB1receptor-evoked activation of JNK, supporting the involvement of a Gi/Go-protein, phosphoinositide 3′-kinase and Ras. THC-induced JNK stimulation was prevented by tyrphostin AG1296, pointing to the implication of platelet-derived growth factor receptor transactivation, and was independent of ceramide generation. Experiments performed with several types of neural cells that endogenously express the CB1 receptor suggested that long-term JNK activation may be involved in THC-induced cell death. The CB1 cannabinoid receptor was also shown to be coupled to the activation of p38 mitogen-activated protein kinase. Data indicate that activation of JNK and p38 mitogen-activated protein kinase may be responsible for some of the cellular responses elicited by the CB1 cannabinoid receptor. Cannabinoids, the active components of Cannabis sativa (marijuana) and their endogenous counterparts, exert most of their central and peripheral effects by binding to specific G-protein-coupled receptors (Howlett, 1995; Felder and Glass, 1998). To date, two different cannabinoid receptors have been characterized and cloned from mammalian tissues: CB1 (Matsuda et al., 1990) and CB2 (Munro et al., 1993). The CB1 receptor is distributed mainly in the central nervous system but is also present in peripheral nerve terminals as well as in extraneural organs such as testis, uterus, spleen, and tonsils. By contrast, the expression of the CB2receptor is almost exclusively restricted to cells and organs of the immune system (Matsuda et al., 1990; Munro et al., 1993; Felder and Glass, 1998). Several signaling pathways triggered by the activation of these receptors have already been described. For example, both the CB1 and the CB2 receptor signal inhibition of adenylyl cyclase and the CB1receptor is coupled to modulation of Ca2+ and K+ channels (Howlett, 1995; Felder and Glass, 1998). The recent discovery of a family of endogenous ligands of cannabinoid receptors (Devane et al., 1992; Di Marzo et al., 1994;Martin et al., 1999) and the potential therapeutic applications of cannabinoids (Voth and Schwartz, 1997) have focused a lot of attention on cannabinoids during the last years. One of the most ubiquitous mechanisms of signal transduction in response to environmental stimuli is the activation of mitogen- and stress-activated protein kinase cascades (Minden and Karin, 1998;Garrington and Johnson, 1999). Members of the extracellular signal-regulated kinase (ERK) family are strongly activated by polypeptide growth factors whose receptors have tyrosine kinase activity and by tumor-promoting phorbol esters, whereas they are usually more weakly activated by stress stimuli and proinflammatory cytokines. In contrast, members of the c-Jun N-terminal kinase (JNK) and the p38 mitogen-activated protein kinase (MAPK) families are potently activated by stress signals but usually more modestly by polypeptide growth factors and phorbol esters. In particular, the widely distributed JNKs may become activated in response to UV- or X-irradiation, heat shock, osmotic shock, proinflammatory cytokines, and certain mitogens (Ip and Davis, 1998; Minden and Karin, 1998). In a manner parallel to the regulation of the related ERK, the JNK family members are activated after their phosphorylation on threonine and tyrosine residues by the dual-specificity upstream kinases MKK4 and MKK7. Once activated, JNK phosphorylates the transactivating domain of transcription factors, such as c-Jun, ATF2, and Elk-1, thereby increasing their stability and transcriptional activity. This in turn results in the control of the expression of genes that directly contribute to the mammalian stress response through changes in the cell cycle, DNA repair, or apoptosis (Ip and Davis, 1998; Minden and Karin, 1998; Garrington and Johnson, 1999). In spite of the well established role of JNK in the regulation of cell differentiation, proliferation, and death in the central nervous system, the possible coupling of the CB1cannabinoid receptor to JNK has not been studied to date. However, several observations indicate that this may be a conceivable possibility: a) the CB1 cannabinoid receptor is coupled to ERK activation (Bouaboula et al., 1995a, b; Sánchez et al., 1998b), b) cannabinoids may induce antiproliferative effects through the CB1 receptor (De Petrocellis et al., 1998; Sánchez et al., 1998a; Chan et al., 1999; Galve-Roperh et al., 2000), and c) by releasing G-protein βγ-subunits, the CB1 cannabinoid receptor should be able to activate small G-proteins such as Ras and Rac, which lie upstream of the JNK cascade (Ip and Davis, 1998; Minden and Karin, 1998). The present work was therefore undertaken to test whether JNK is activated by the CB1 cannabinoid receptor. The following materials were kindly donated: Chinese hamster ovary (CHO) cells stably transfected with the rat CB1 cannabinoid receptor cDNA by Dr. T. I. Bonner (National Institutes of Health, Bethesda, MD) and Dr. Z. Vogel (The Weizmann Institute, Rehovot, Israel); SR 141716 by Sanofi Recherche (Montpellier, France); CP-55,940 by Dr. J. A. Ramos and Dr. J. J. Fernández-Ruiz (Complutense University, Madrid, Spain); HU-210 by Prof. R. Mechoulam (Hebrew University, Jerusalem, Israel); and the anti-actin monoclonal antibody by Dr. P. M. P. van Bergen en Henegouwen (Utrecht University, The Netherlands). Δ9-Tetrahydrocannabinol (THC), anandamide, and methanandamide were from Sigma (St. Louis, MO). 2-Arachidonoylglycerol was from Cayman Chemical (Ann Arbor, MI). Wild-type CHO cells were maintained in Dulbecco's modified Eagle's medium supplemented with 8% fetal calf serum and nonessential amino acids. CHO cells transfected with the CB1 receptor cDNA were grown in the same medium supplemented with 0.5 mg/ml geneticin. Wild-type and transfected CHO cells are referred to as CHO-wt and CHO-CB1cells, respectively. The rat glioma C6.9 and C6.4 subclones (Galve-Roperh et al., 2000), the human astrocytoma U373 MG (Sánchez et al., 1998a), rat cortical primary astrocytes (Sánchez et al., 1998b), and rat cortical primary neurons (Sánchez et al., 1998a) were cultured as described previously. Twenty-four hours before the experiment, cells were transferred to their respective serum-free media. Stock solutions of cannabinoids were prepared in dimethyl sulfoxide. Control incubations had the corresponding dimethyl sulfoxide content. No significant influence of dimethyl sulfoxide was observed on any of the parameters determined at the final concentration used (0.1%, v/v). Cell viability was determined by Trypan blue exclusion. Assay of JNK and p38 MAPK Activity. Cells were exposed to the different agents for the times indicated. Cells were subsequently washed with ice-cold phosphate-buffered saline (10 mM sodium phosphate, 150 mM NaCl, pH 7.4) and scraped in lysis buffer consisting of 50 mM Tris-HCl, pH 7.5, 0.1% (w/v) Triton X-100, 1 mM EDTA, 1 mM EGTA, 50 mM NaF, 10 mM sodium β-glycerophosphate, 5 mM sodium pyrophosphate, 1 mM sodium orthovanadate, 0.1% (v/v) 2-mercaptoethanol, 0.5 μM microcystin-LR, 17.5 μg/ml phenylmethylsulfonyl fluoride, 5 μg/ml leupeptin, 2 μg/ml aprotinin, 20 μg/ml soybean trypsin inhibitor, 5 μg/ml benzamidine. Lysates were centrifuged for 15 min at 13,000g, and the activity of JNK and p38 MAPK was monitored as the incorporation of [γ-32P]ATP into specific substrates (c-Jun 1–169 and MAPK activated protein kinase-2 46–600) following dodecyl sulfate-polyacrylamide gel electrophoresis, autoradiography, and radioactive counting of the phosphorylated substrate bands according to manufacturer's instructions (Upstate Biotechnology, Lake Placid, NY). Western Blot Analysis of JNK Isoforms. Cells lysates were obtained as described above for determination of JNK activity. Samples were subjected to SDS-polyacrylamide gel electrophoresis in 10% gels, and proteins were transferred from SDS gels onto nitrocellulose membranes. The blots were then blocked with 5% fat-free dried milk in 50 mM Tris-HCl, pH 7.8, 100 mM NaCl, 0.1% Tween 20 (TBST). They were subsequently incubated for 1 h at 4°C with a monoclonal anti-phospho-Thr-183/Tyr-185-JNK antibody (1:1000 in TBST supplemented with 1% fat-free dried milk) that recognizes phosphorylated JNK-1 and JNK-2 isoforms (Santa Cruz Biotechnology, Santa Cruz, CA). After the blots were washed thoroughly, they were incubated with anti-mouse peroxidase-conjugated secondary antibody (1:10,000) for 1 h at 4°C and finally subjected to luminography with an electrochemiluminescence detection kit. Loading controls were carried out with an anti-actin antibody. Cells were transferred to chemically defined medium supplemented with 1 μCi ofl-[U-14C]serine per well. After 48 h, reactions were started by the addition of the cannabinoids and were terminated after different times by aspiration of the medium and addition of 1 ml of methanol. Lipids were extracted and saponified, and ceramide and sphingomyelin were resolved by thin-layer chromatography in parallel with standards on silica-gel G60 plates with chloroform:methanol:water (100:42:6, v/v/v) as developing system until the front reached two-thirds of the plate. The solvent was then evaporated and plates were subsequently run with chloroform:methanol:acetic acid (94:1:5, v/v/v) until the front reached the top of the plate (Blázquez et al., 1999). Results shown represent the means ± S.D. of the number of experiments indicated in every case. Statistical analysis was performed by ANOVA. A post hoc analysis was made by the Student-Neuman-Keuls test. The CB1 Cannabinoid Receptor Is Coupled to JNK Activation. CHO cells stably transfected with the CB1 receptor cDNA constitute a well characterized model to study the signal transduction pathways modulated by this receptor. Here we used these cells to test the possible coupling of the CB1 receptor to JNK activation. CHO cells were treated for different times with THC, the major active component of marijuana. Cells were subsequently lysed, and JNK activity was determined. As shown in Fig. 1A, THC induced a time-dependent stimulation of JNK in CHO-CB1 cells. The effect of THC was transient, reaching a maximum at 5 to 10 min. Several experiments were subsequently performed to demonstrate the involvement of the CB1 receptor in the THC-induced stimulation of JNK in CHO-CB1 cells. a) Half-maximal stimulation of JNK by THC occurred at a concentration of ca. 5 nM (Fig. 1B), i.e., in the range of the K d value of THC for the CB1 receptor (Howlett, 1995). b) The synthetic cannabinoids CP-55,940 and HU-210 were able to stimulate JNK to an extent similar to THC (Fig. 2). c) The stimulatory effect of THC on JNK was abolished by treatment of cells with SR141716, a selective CB1 receptor antagonist, which did not exert any effect per se on JNK activity (Fig.2). d) The stimulation of JNK induced by THC, CP-55,940, and HU-210 in CHO-CB1 cells was not evident in CHO-wt cells (Fig. 2). THC induces JNK activation. A, time course. CHO-CB1 cells were incubated with 1 μM THC for different times. Inset, Representative autoradiogram of c-Jun phosphorylation in CHO-CB1 cells treated with THC for the times (minutes) indicated. B, dose-response. CHO-CB1 cells were incubated with different THC concentrations for 5 min. In both panels, results are expressed as percentages of incubations with no additions and correspond to four different experiments. The CB1 cannabinoid receptor is coupled to JNK activation. CHO cells were incubated with or without 1 μM SR141716 (SR) for 30 min and then with or without the cannabinoids [1 μM THC, 25 nM CP-55940 (CP), 25 nM HU-210, 15 μM anandamide (AEA), 15 μM 2-arachidonoylglycerol (2-AG), or 15 μM methananandamide (M-AEA)] for an additional 5 min. A, representative autoradiograms of c-Jun phosphorylation in CHO-CB1 and CHO-wt cells exposed to different additions. AA, arachidonic acid. B, results from four different experiments in CHO-CB1 cells (closed bars) and CHO-wt cells (open bars) are expressed as percentage of incubations with no additions. Significantly different from incubations with no additions: *P < .01; **P < .05. The endogenous cannabinoids anandamide and 2-arachydonoylglycerol stimulated JNK to an extent higher than other cannabinoid agonists (Fig. 2). These endocannabinoids are known to be actively degraded by cellular fatty acid amide hydrolase to arachidonic acid and ethanolamine or glycerol, respectively (Martin et al., 1999). As shown in Fig. 2, in CHO-CB1 cells the effect of anandamide and 2-arachidonoylglycerol on JNK was not completely blocked by SR141716. In addition, in CHO-wt cells, anandamide and 2-arachidonoylglycerol induced a slight, although reproducible, activation of JNK. Methanandamide, a stable synthetic analog of anandamide (Martin et al., 1999), also stimulated JNK in CHO-CB1 cells. 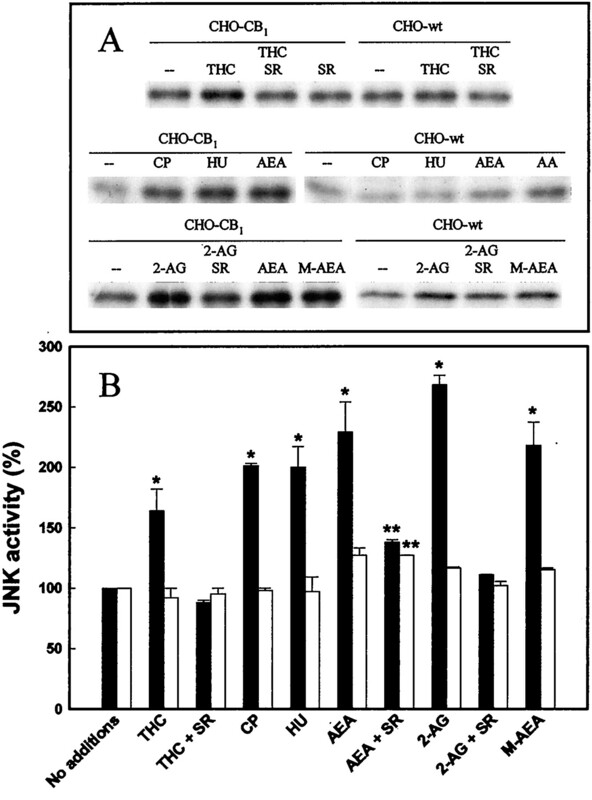 Moreover, arachidonic acid stimulated JNK in CHO-wt cells (151 ± 6% stimulation by 15 μM arachidonic acid, n = 3, P < .01 versus incubations with no additions; Fig. 2). These observations indicate that endocannabinoids stimulate JNK activity mostly by a CB1 receptor-dependent mechanism, with a minor contribution of a CB1 receptor-independent mechanism. The two major JNK isoforms (i.e., JNK-1 and JNK-2) may become differently activated by extracellular stimuli (cf. Ip and Davis, 1998;Minden and Karin, 1998). The contribution of these two isoforms to THC-induced JNK activation was assessed by Western blot with an antibody that recognizes phosphorylated (= activated) JNK-1 and JNK-2. As shown in Fig. 3, CHO cells expressed mostly the JNK-1 isoform. However, densitometric analysis of the luminograms showed that THC induced a similar increase in the phosphorylation of JNK-1 (33 ± 10% over incubations with no additions, n = 3) and JNK-2 (30 ± 6% over incubations with no additions, n = 3) in CHO-CB1 cells. This effect was not evident in CHO-wt cells and was prevented by SR141716 (Fig. 3). THC induces the phosphorylation of both JNK-1 and JNK-2. CHO-CB1 cells and CHO-wt cells were incubated with or without 1 μM SR141716 (SR) for 30 min and then with or without 1 μM THC for an additional 5 min. Cell lysates were subsequently subjected to Western blot with an anti-phospho-Thr-183/Tyr-185-JNK antibody that recognizes phosphorylated JNK-1 and JNK-2. Loading controls were carried out with an anti-actin antibody. The CB1 Cannabinoid Receptor Induces JNK Activation via a Gi/Go-Protein-, Phosphoinositide 3′-kinase (PI3K)-, and Ras-Dependent Pathway. The CB1receptor is coupled to Gi/Go-proteins (Howlett, 1995). To further investigate the signal transduction pathway responsible for JNK activation, the possible involvement of a Gi/Go-protein was studied by examining the effect of pertussis toxin and mastoparan. As shown in Fig. 4, blockade of Gi/Go-protein dissociation with pertussis toxin abrogated the THC-induced activation of JNK in CHO-CB1 cells. In addition, induction of Gi/Go-protein dissociation with mastoparan induced a remarkable stimulation of JNK that was not additive to that exerted by THC. The CB1 cannabinoid receptor induces JNK activation via a Gi/Go-protein-, PI3K-, and Ras-dependent pathway. CHO-CB1 cells were incubated with or without 15 μM mastoparan (MAS, 20 min), 50 ng/ml pertussis toxin (PTX, 14 h), 0.2 μM wortmannin (WM, 20 min), or 5 μM Cys-Val-2-naphthyl-3-alanyl-Met (FTI, 14 h) and then with or without 1 μM THC for an additional 5 min. Results are expressed as percentage of incubations with no additions and correspond to four different experiments. Significantly different from incubations with no additions: *P < .01. Inset, representative autoradiograms of c-Jun phosphorylation in CHO-CB1 cells exposed to different additions. It has been shown that wortmannin, a PI3K inhibitor, blocks the cannabinoid-induced stimulation of ERK (Bouaboula et al., 1997) and glucose metabolism (Sánchez et al., 1998b) in cells expressing the CB1 receptor. Class IBPI3Ks, i.e., PI3K isoenzymes devoid of Src homology domains and activated by G-protein βγ-subunits, may mediate the activation of small G-proteins such as Ras and therefore stimulate the ERK cascade (Fruman et al., 1998). As shown in Fig. 4, the THC-induced activation of JNK in CHO-CB1 cells was fully prevented by wortmannin and the Ras farnesyltransferase inhibitor Cys-Val-2-naphthyl-3-alanyl-Met. The CB1 Cannabinoid Receptor May Induce JNK Activation through Transactivation of Platelet-Derived Growth Factor (PDGF) Receptors. It is currently known that some G-protein-coupled receptors may mediate the activation of the Ras/ERK cascade via transactivation of receptors with tyrosine kinase activity, mostly epidermal growth factor (EGF) receptors (Hackel et al., l999; Luttrell et al., 1999). For example, in cells expressing EGF receptors ERK activation evoked by lysophosphatidic acid is prevented by the tyrphostin AG1478, a selective inhibitor of EGF receptor tyrosine kinase. Alternatively, studies conducted with the tyrphostin AG1296, which selectively inhibits PDGF receptor tyrosine kinase, indicate that transactivation of this receptor may mediate lysophosphatidic acid-induced ERK activation in cells that do not express EGF receptors (Herrlich et al., 1998). CHO cells have been reported to express PDGF receptors (e.g., Duckworth and Cantley, 1997) but not EGF receptors (e.g., Morrison et al., 1993). Thus, as expected, in CHO-CB1 cells PDGF activated JNK, whereas EGF had no effect (Table 1). Moreover, the THC-induced stimulation of JNK was prevented by AG1296 but not by AG1478, pointing to the involvement of PDGF receptor transactivation. The CB1 Cannabinoid Receptor Induces JNK Activation Independently of Ceramide. Ceramide plays an important role in the control of basic cell functions such as proliferation, differentiation, and death (Kolesnick and Krönke, 1998). Ceramide generation through sphingomyelin hydrolysis by acid sphingomyelinase is believed to mediate in some instances the activation of the JNK cascade and in turn may evoke changes in the cell proliferation/death decision (Kolesnick and Krönke, 1998). 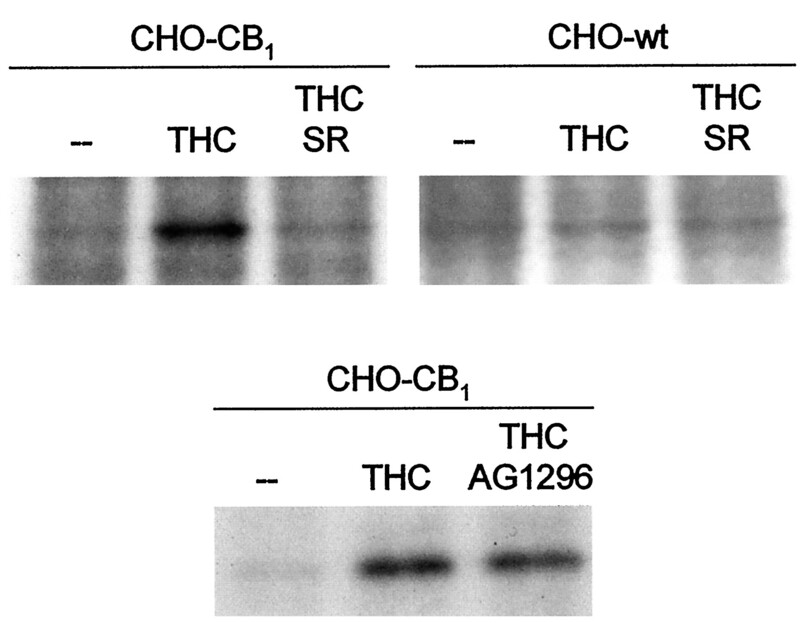 However, exposure of CHO-CB1 cells to THC (Fig.5) or CP-55,940 (results not shown) did not induce any significant change in the cellular levels of sphingomyelin and ceramide. In addition, the acid sphingomyelinase inhibitor desipramine (50 μM, 90-min preincubation) did not prevent the THC-evoked activation of JNK (results not shown). 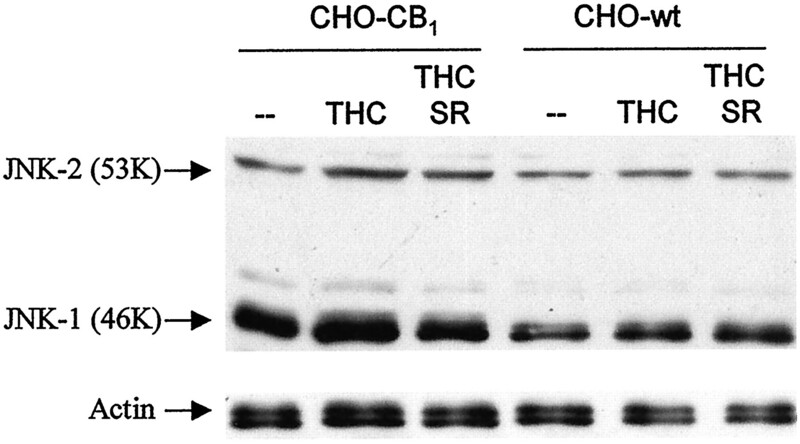 THC does not induce changes in sphingomyelin and ceramide levels in CHO-CB1 cells. CHO-CB1 cells were incubated with 1 μM THC for different times and levels of sphingomyelin (○) and ceramide (●) were determined. Results are expressed as percentage of incubations with no additions and correspond to four different experiments. Cannabinoids Stimulate JNK in Cells Endogenously Expressing the CB1 Receptor. To test whether the cannabinoid-induced stimulation of JNK observed in CHO cells heterologously expressing the CB1 receptor could be extrapolated to cells naturally expressing this receptor, we examined the effect of cannabinoids on various neural cells that express the CB1 receptor (Sánchez et al., 1998a;Galve-Roperh et al., 2000). As shown in Table2, THC activated JNK acutely in two subclones of C6 glioma cells (namely, C6.9 and C6.4) that exhibit a distinct sensitivity to THC-induced apoptosis (Galve-Roperh et al., 2000). Short-term THC challenge induced a slight (although statistically significant) stimulation of JNK in U373 MG astrocytoma cells and primary astrocytes but not in primary neurons. To test whether sustained JNK activation may be involved in the control of cell fate in our experimental system, cells were exposed to THC for 3 days, and JNK activity and cell viability were monitored. As shown in Table 2, viability was not significantly altered in cells in which JNK activity was either unaffected (primary neurons and astrocytes and CHO-CB1 cells) or modestly induced (glioma C6.4 and astrocytoma U373 MG) upon prolonged cannabinoid exposure. However, the remarkable induction of JNK activity observed in the glioma C6.9 was accompanied by a significant decrease in cell viability. The CB1 Cannabinoid Receptor Is Coupled to p38 MAPK Activation. Compared to the readily activated JNKs, the p38 MAPK family members are usually activated by a more restricted array of stress stimuli. However, p38 MAPK plays an important role in cell response to osmotic and inflammatory stress (Herlaar and Brown, 1999). 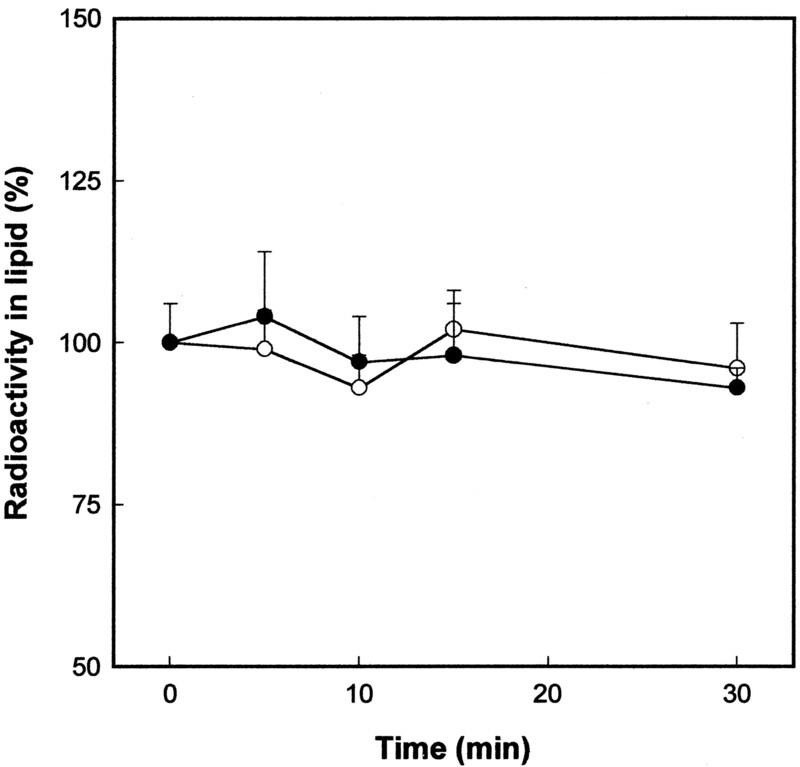 THC stimulated p38 MAPK in CHO-CB1 cells (Fig.6) by 52 ± 7% (n = 3, P < .01 versus incubations with no additions). This effect was prevented by SR141716 and was not evident in CHO-wt cells (Fig. 6), pointing to the involvement of the CB1receptor. Cannabinoid-induced p38 MAPK activation, unlike cannabinoid-induced JNK activation, was not prevented by AG1296 (Fig.6), indicating that PDGF receptor transactivation is not involved in the former effect. The CB1 cannabinoid receptor is coupled to p38 MAPK activation independently of PDGF receptor transactivation. CHO cells were incubated with or without 1 μM SR141716 (SR; 30 min) or 30 μM AG1296 (10 min) and then with or without 1 μM THC for an additional 5 min. MAPK activated protein kinase-2 phosphorylation was subsequently determined in cell lysates. Receptor Dependence of the Cannabinoid-Induced JNK Activation. Data herein show that the CB1 cannabinoid receptor is coupled to JNK activation. This assumption is based mostly on the stimulation of JNK induced by synthetic and plant-derived cannabinoids in CHO-CB1 cells, but not in CHO-wt cells, as well as on the antagonism exerted by pertussis toxin and SR141716. We are aware that the latter compound has been shown to behave as an inverse agonist in a number of experimental models in vitro and in vivo (Bouaboula et al., 1997). However, we have been unable to demonstrate any effect of SR141716 on basal JNK activity in CHO-CB1 cells. The endocannabinoids anandamide and 2-arachidonoylglycerol seemed to exert part of their stimulatory action on JNK activity by a CB1receptor-independent mechanism that may involve arachidonic acid release. This is in line with the arachidonic acid-induced stimulation of JNK reported by Shin et al. (1999). Many studies have demonstrated an involvement of the ERK and JNK cascades in the regulation of cell proliferation by G-protein-coupled receptors (Gutkind, 1998; Luttrell et al., 1999). Cannabinoid receptors are coupled to Gi/Go-proteins (Howlett, 1995). The βγ-subunits released from heterotrimeric Gi- and Go-proteins are known to mediate the stimulation of small G-proteins such as Ras involved in the activation of the ERK and JNK cascades via class IB PI3Ks (Fruman et al., 1998; Minden and Karin, 1998; Luttrell et al., 1999). More recently, the α-subunits released from Gi- (Mochizuki et al., 1999) and Go-proteins (Jordan et al., 1999) have been shown to mediate ERK activation via a Ras- and PI3K-independent pathway. It is well established that Ras is the major small G-protein involved in the activation of the Raf-1/ERK cascade; however, the JNK cascade may be also activated by Rac and in some instances by Rho and Cdc42 (Minden and Karin, 1998; Yamauchi et al., 1999). Although conflicting results exist concerning the relative importance of Ras and Rac in the activation of the JNK cascade, most likely both proteins are activatory components of the JNK cascade, Ras lying upstream of Rac (Scita et al., 1999). The CB1 cannabinoid receptor seems to be coupled to the activation of the ERK and JNK cascades through a common upstream mechanism involving Gi/Go-protein βγ-subunits, class IB PI3K, and Ras. Current research is focused on the characterization of other elements linking the CB1 receptor to the JNK cascade, one of which could be focal adhesion kinase. This kinase, which has been shown to be phosphorylated by anandamide in primary neurons, is capable of activating small G-proteins such as Ras and may play an important role in the regulation of neuronal activity, plasticity, and survival (Girault et al., 1999). Some G-protein-coupled receptors such as those for lysophosphatidic acid, thrombin, and angiotensin II may mediate the activation of the Ras/ERK cascade via transactivation of receptors with tyrosine kinase activity (Hackel et al., 1999; Luttrell et al., 1999). Our data indicate for the first time that the CB1cannabinoid receptor may stimulate a protein kinase cascade such as the JNK cascade via transactivation of PDGF receptors. Interestingly, cannabinoid-induced stimulation of p38 MAPK was not prevented by AG1296, pointing to the existence of divergent pathways for JNK and p38 MAPK activation. Transactivation of EGF and PDGF receptors has been suggested to be the link between the release of Gi/Go-protein βγ-subunits, leading to class IB PI3K/Src activation, and the stimulation of Ras via Shc/Grb-2/Sos (Hackel et al., 1999; Luttrell et al., 1999). Although cannabinoid receptors do not share a very high sequential homology with other receptors, they show a certain structural similarity with members of the EDG family of G-protein-coupled receptors (Yamaguchi et al., 1996). Ligands of these receptors include bioactive long-chain fatty acid derivatives such as lysophosphatidic acid and sphingosine 1-phosphate, whose structure resembles that of endocannabinoids. Lysophosphatidic acid and sphingosine 1-phosphate play an important role in the regulation of key cell functions such as proliferation, protection from apoptosis, differentiation, migration, and Ca2+mobilization. Of interest, both lysophosphatidic acid receptors (Herrlich et al., 1998) and sphingosine 1-phosphate receptors (Pyne et al., 1999) are capable of stimulating ERK via transactivation of PDGF receptors. Although the actual biological functions of the endogenous cannabinoid system are as yet unknown, it is believed that endogenous cannabinoids might play a role in brain development and function. Thus, the significance of the endogenous cannabinoid system is supported by the high levels of cannabinoid receptors found in brain; the specific mechanisms of endocannabinoid synthesis, uptake, and degradation in neural cells; and the neuromodulatory properties of endogenous cannabinoids (Felder and Glass, 1998; Martin et al., 1999). One of the most intriguing and unexplored actions of cannabinoids is their ability to control cell growth. Thus, cannabinoids have been shown to induce antiproliferative effects through the CB1 receptor in a number of cultured cell systems (De Petrocellis et al., 1998; Sánchez et al., 1998a; Chan et al., 1999; Galve-Roperh et al., 2000). Data in this report may help to explain the signal transduction mechanisms involved in cell growth control by cannabinoids. Thus, there might be a threshold above which cannabinoid-induced long-term JNK activation would lead to neural cell death. In the context of these findings, one could speculate that by modulating the balance among ERK, JNK, and p38 MAPK activities the CB1 cannabinoid receptor might regulate the fate of neural cells (regarding, e.g., proliferation, differentiation, and death) in response to environmental stimuli (cf. Datta and Greenberg, 1998; Derkinderen et al., 1999). Moreover, we have recently shown that cannabinoids are able to modulate through the CB1 receptor the activity of the PI3K/protein kinase B pathway, which serves as a pivotal antiapoptotic signal (Gómez del Pulgar et al., 2000). It is clear that further research is required to understand the physiological role of cannabinoids as modulators of cell fate. We are indebted to Dr. C. Sánchez and T. Gómez del Pulgar for expert assistance in the determination of ceramide and sphingomyelin levels. It has been recently shown that anandamide stimulates ERK, JNK and p38 MAPK in the ECV cell line derived from human umbilical vein endothelial cells via CB1receptor-dependent and independent mechanisms [Liu J, Mirshahi F, Sanyal AJ, Khanolkar AD, Makriyannis A and Kunos G (2000) Functional CB1 cannabinoid receptors in human vascular endothelial cells. Biochem J 346:835–840.]. This study was supported by grants from Comisión Interministerial de Ciencia y Tecnologı́a (PM 98/0079) and Comunidad Autónoma de Madrid (CAM 08.5/0017/98). (1999) The stimulation of ketogenesis by cannabinoids in astrocytes defines carnitine palmitoyltransferase I as a new ceramide-activated enzyme. J Neurochem 72:1759–1768. (1995a) Stimulation of cannabinoid receptor CB1 induces krox-24 expression in human astrocytoma cells. J Biol Chem 270:13973–13980. (1995b) Activation of mitogen-activated protein kinases by stimulation of the central cannabinoid receptor CB1. Biochem J 312:637–641. (1997) A selective inverse agonist for central cannabinoid receptor inhibits mitogen-activated protein kinase activation stimulated by insulin or insulin-like growth factor 1: Evidence for a new model of receptor/ligand interactions. J Biol Chem 272:22330–22339. (1999) Hippocampal neurotoxicity of Δ9-tetrahydrocannabinol. J Neurosci 18:5322–5332. (1998) Molecular mechanisms of neuronal survival and apoptosis. Horm Signal 1:257–306. (1998) The endogenous cannabinoid anandamide inhibits human breast cancer cell proliferation. Proc Natl Acad Sci USA 95:8375–8380. (1999) The ERK/MAP-kinases cascade in the nervous system. Neuroreport 10:R24–R34. (1992) Isolation and structure of a brain constituent that binds to the cannabinoid receptor. Science (Wash DC) 258:1946–1949. (1994) Formation and inactivation of endogenous cannabinoid anandamide. Nature (Lond) 372:686–691. (1997) Conditional inhibition of the mitogen-activated protein kinase cascade by wortmannin: Dependence on signal strength. J Biol Chem 272:27665–27670. (1998) Cannabinoid receptors and their endogenous agonists. Annu Rev Pharmacol Toxicol 38:179–200. (1998) Phosphoinositide kinases. Annu Rev Biochem 67:481–507. (2000) Antitumoral action of cannabinoids: Involvement of sustained ceramide accumulation and extracellular signal-regulated kinase activation. Nat Med 6:313–319. (1999) Organization and regulation of mitogen-activated protein kinase signaling pathways. Curr Opin Cell Biol 11:211–218. (1999) FAK and PYK2/CAKβ: A link between neuronal activity, plasticity and survival? Trends Neurosci 22:257–263. (2000) The CB1 cannabinoid receptor is coupled to the activation of protein kinase B/Akt. Biochem J 347:369–373. (1999) Epidermal growth factor receptors: Critical mediators of multiple receptor pathways. Curr Opin Cell Biol 11:184–189. (1999) p38 MAPK signalling cascades in inflammatory disease. Mol Med Today 5:439–447. (1998) Ligand-independent activation of platelet-derived growth factor receptor is a necessary intermediate in lysophosphatidic acid-stimulated mitogenic activity in L cells. Proc Natl Acad Sci USA 95:8985–8990. (1998) Signal transduction by the c-Jun N-terminal kinase (JNK): From inflammation to development. Curr Opin Cell Biol 10:205–219. (1999) Modulation of Rap activity by direct interaction of Gαo with Rap1 GTPase-activating protein. J Biol Chem 274:21507–21510. (1998) Regulation of ceramide production and apoptosis. Annu Rev Physiol 60:643–665. (1999) Regulation of tyrosine kinase cascades by G-protein-coupled receptors. Curr Opin Cell Biol 11:177–183. (1999) Discovery and characterization of endogenous cannabinoids. Life Sci 65:573–595. (1990) Structure of a cannabinoid receptor and functional expression of the cloned cDNA. Nature (Lond) 346:561–564. (1998) The JNK family of MAP kinases: Regulation and function. Horm Signal 1:209–233. (1999) Activation of the ERK/MAPK pathway by an isoform of rap1GAP associated with Gαi. Nature (Lond) 400:891–894. (1993) Role of threonine residues in regulation of the epidermal growth factor receptor by protein kinase C and mitogen-activated protein kinase. J Biol Chem 268:15536–15543. (1993) Molecular characterization of a peripheral receptor for cannabinoids. Nature (Lond) 365:61–65. (1999) Extracellular actions of sphingosine 1-phosphate through endothelial differentiation gene products in mammalian cells: Role in regulating proliferation and apoptosis. Biochem Soc Trans 27:404–409. (1998a) Δ9-Tetrahydrocannabinol induces apoptosis in C6 glioma cells. FEBS Lett 436:6–10. (1998b) Involvement of sphingomyelin hydrolysis and the mitogen-activated protein kinase cascade in the Δ9-tetrahydrocannabinol-induced stimulation of glucose metabolism in primary astrocytes. Mol Pharmacol 54:834–843. (1999) EPS8 and E3B1 transduce signals from Ras to Rac. Nature (Lond) 401:290–293. (1999) Arachidonic acid induces the activation of the stress-activated protein kinase, membrane ruffling and H2O2 production via a small GTPase Rac1. FEBS Lett 452:355–359. (1996) Molecular cloning of the novel human G protein-coupled receptor (GPCR) gene mapped on chromosome 9. Biochem Biophys Res Commun 227:608–614. (1999) Differential regulation of mitogen-activated protein kinase kinase 4 (MKK4) and 7 (MKK7) by signaling from G protein βγ subunit in human embryonal kidney 293 cells. J Biol Chem 274:1957–1965.